Each year Cascia (PG), from May 12th to 22nd, celebrates his favorite daughter and Patron Saint, Saint Rita of Cascia, thanks to the Ritiane Celebrations and to the Feast of St. Rita. 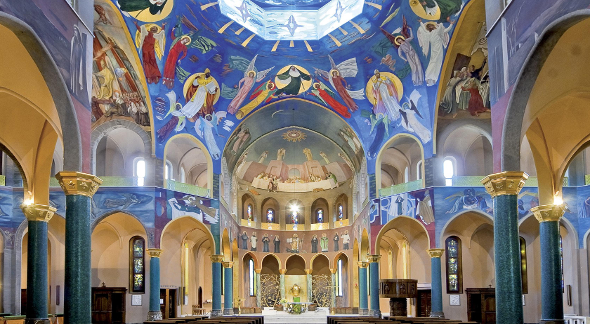 The celebration schedules the well-known adorations of "Thursdays of Saint Rita". Born nearly 300 years ago, even now the appointments includes many initiatives and faith meetings. On May 12th begins the Solemn Novena of Saint Rita, with the participation of other inhabitants from the towns of Nera Valley. Following the peaceful message of Saint Rita, they organize all the events and also special pilgrimages in a spirit of deep collaboration. This authentic need for brotherhood is expressed also through the twinning of Cascia with a different Italian or European city each year. Cascia and its twin city organize some meetings and particular themed initiatives during the year, to create a strong relationship between them. The message of this twinning for Cascia is to enhance and spread the values of Saint Rita: the hope and the wish of living together days of feast, with deep devotion and faith. One of the most impressive moment during them is the lighting on of the "Peace Torch", messenger of Christian hope. Its flames represent the love and the veneration of Saint Rita. Every year, in the preceding days of the Feast of Saint Rita - generally one week previous - the "Peace Torch" leaves its native city thanks to a sports group of athletes. They reach Cascia with many relay races... marathon runners, cyclists, skaters etc. all of them will be in Cascia on the evening of 21 May, in front of the Cathedral of Saint Rita, to deliver the torch to the mayor of their own city. Then the mayor in turn will deliver the torch to the Mayors of Cascia and of other towns of Nera Valley. The torch will be fix to a monumental tripod, sealing their enduring friendship. All night long, thousand of torches will flame Cascia and also around the hills: it is called the fire of faith, a fire ritual in honor of the Saint. The torches light up a dynamic night because of the continuous arrival of the pilgrims. The next day, the faithful by the thousands will wait along the edges of the streets until the procession. 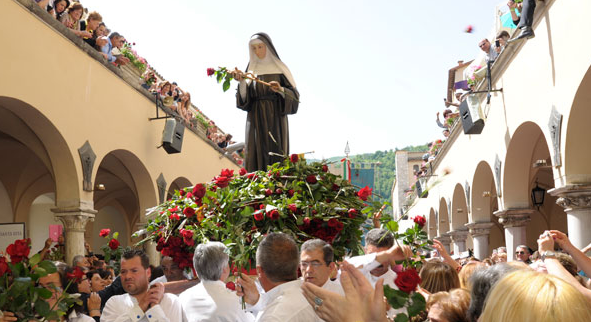 The procession in Cascia, which joins also the one from Roccaporena, is the most awaited moment by those who want to regain strength living the emotion of the life of Saint Rita. The procession is also particularly awaited by many tourists who appreciate the historical accuracy of the parade, that reenacts the history and the human side of the Saint. Reenacting the life of Saint Rita and with it some aspects of the Medieval life, they tell a story of love and hate, guelfi and ghibellini, from a unusual feminine point of vue. Elsewhere king and knights dominate these events; here, in Cascia, the main character is a humble woman, a tiny one but with a inestructible faith and determinate in her values of peace. Her army are her people: shepherds, craftsmen, nuns, common people. 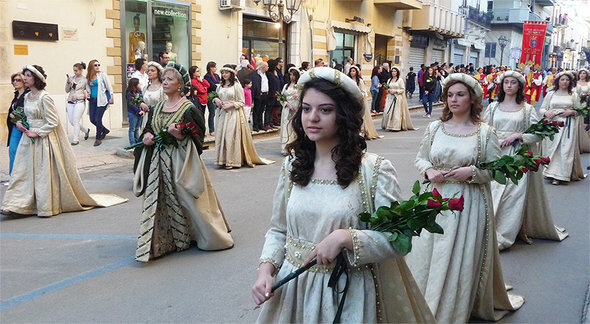 The procession crosses the city of Cascia until the Cathedral of Saint Rita, where is scheduled the Holy Benediction. 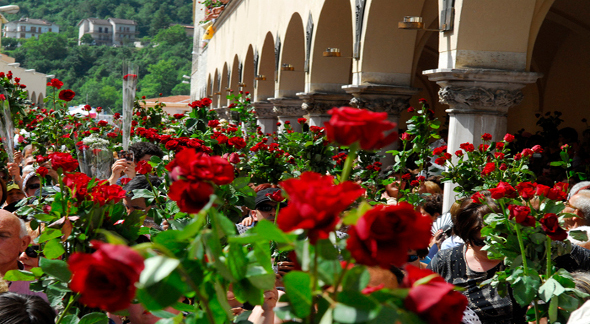 The roles are reversed and spectators become protagonists: thousand of people raise to the sky their bouquet of roses, the flower loved by Saint Rita, her symbol. A poetic gesture that renews a miracle of the 15h century. Procession of the Banner - The procession started in 1731 to thank the Blessed Rita of her protection over the city during the earthquake of 1730. Year by year, they had during the procession a banner painted by the Municipality of Cascia in 1614. It illustrated the entrance of Rita in the augustinian Monastery of Saint Maria Maddalena and the act of receiving her stigmata. International Award of Saint Rita - Every year, an important media information character presents the women protagonists of the award, called the "Women of Saint Rita". The award wants to reward women who spread the message of Rita around the world. Torch - Every year Cascia shines to reenact the death of Saint Rita, when many people came to the Monastery to give thanks to her. Thousand of torches sparkled that night and shine today as the tradition. They create a unique show, while the athletes of the current Twin City arrive to the Cathedral. Benediction of Roses - Ending the celebration, all the pilgrims arise their bouquet of roses to receive the holy benediction. Thanks to the roses, they will share it with their family and friends at their own home.